Click on the Registration Form to access the form. It will download. 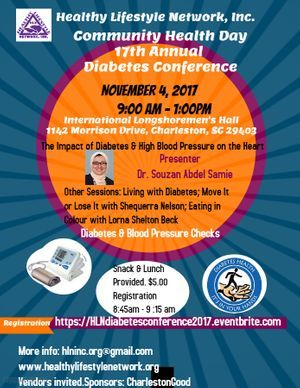 Community Health Day is a conference and expo held every November during National Diabetes Month. The speakers for 2017 are Dr. Souzan Abdel Samie, Roper/St Francis, Ms. Lorna Shelton Beck, RD., CDE. Dr. Cheryl Lynch and Ms. Shequerra Nelson. The theme is The Impact of Diabetes and High Blood on the Heart. This conference is filled with important information, and diabetes and blood pressure checks. Diabetes mellitus describes a group of metabolic diseases in which the person has high blood glucose (blood sugar), either because insulin production is inadequate, or because the body's cells do not respond properly to insulin, or both. Patients with high blood sugar will typically experience polyuria (frequent urination), they will become increasingly thirsty (polydipsia) and hungry (polyphagia). Some people may be able to control their type 2 diabetes symptoms by losing weight, following a healthy diet, doing plenty of exercise, and monitoring their blood glucose levels. However, type 2 diabetes is typically a progressive disease - it gradually gets worse - and the patient will probably end up taking insulin infections. The risk of developing type 2 diabetes is also greater as we get older. Experts are not completely sure why, but say that as we age we tend to put on weight and become less physically active. Those with a close relative who has or had type 2 diabetes, people of Middle Eastern, African, or South Asian descent also have a higher risk of developing the disease. Community Health Day allows individuals with type 2 diabetes to participate in variety of interactive learning sessions to take charge and better manage their disease, and prepare individuals at risk for developing disease to learn techniques to delay the onset. The day consists of presentations, exercise sessions, healthy lunch, and door prizes. Visit our Donation Page and make a contribution.